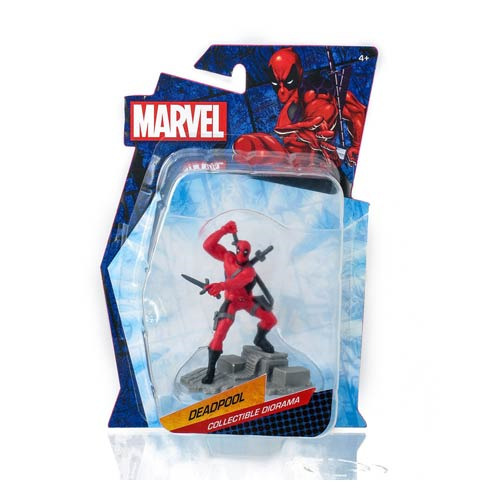 It's your favorite merc with a mouth here to tell you about this totally sweet Deadpool Marvel Heroes Collectible Diorama Mini-Figure, featuring yours truly! My best buds over at Monogram did a great job getting my likeness down on this little guy, they even put me in my stabby-sword pose, complete with a base! Do you love me? I'm so handsome as a 3-inch tall mini-figure, of course you do! So go ahead and click that add to cart button and take me home already! Well, my chimichanga's gettin' cold. Deadpool out! Ages 4 and up.